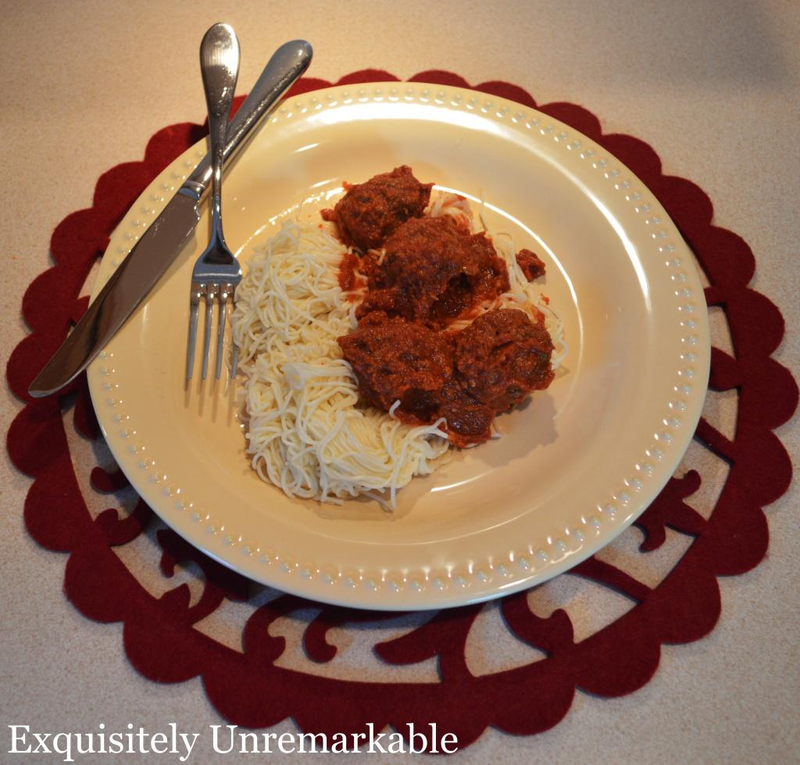 The idea of making a traditionally time consuming dish, like spaghetti and meatballs, does not normally appeal to me. I do not love the fact that I have to stay home for hours, babysitting a bubbling pot, frankly, nor do I have the time. There is always an errand or carpool calling me, unfortunately, even on a Sunday. For meals that require that much of my undivided attention, I turn to my crock pot. In some parts of the country, I guess it's called a slow cooker, but either way, most people have one. It's a staple at bridal showers and like most newlyweds, we found it to be a rather unexciting gift at first. However, once I learned of its amazing culinary abilities, I was hooked. My husband didn't fall in love with it until very recently when he started making pulled pork. He's hooked now, too! 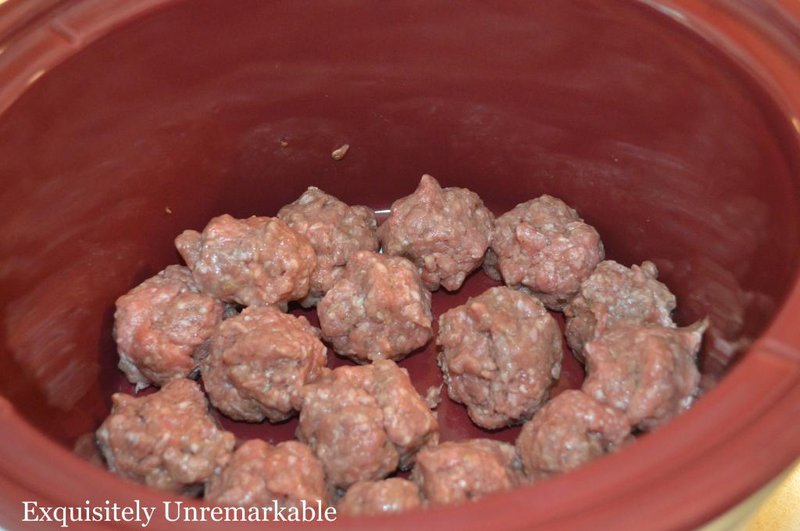 Meatballs in the crock pot are super simple. I do not cook my meatballs first, that alone is a huge plus. I either roll them up and place them on the bottom of the pot and then add my other ingredients or I start with the puree and gingerly drop the meatballs into the sauce. I have not found that it makes a bit of difference either way. The best advice I can dish out here is make meatballs according your favorite recipe. Grab your favorite ingredients for your sauce and place everything in the pot. There is no need to sauté garlic or onions, just drop it in, raw. Turn the pot on for 4-6 hours on high, boil up some pasta, bake a little garlic bread and dinner is served. For those of you who prefer a step by step, I will share my recipe. I always like to point out though, that I am not really precise with my measuring and I do a lot of tasting along the way, especially with sauce. Remember, the meat and eggs are raw, so if you are going to taste it, wait a few hours to ensure that everything is cooked. I am also not a fan of bready meat...I don't use breadcrumbs or crackers in my meatballs or meatloaf. I didn't forget them, I just don't use them. Lastly, it should be noted that a really good meat sauce usually tastes best the next day! I have no idea why, I'm sure there's some fancy science involved, but I just chalk it up to the refrigerator fairy! 1 pound ground beef~ the leaner, the better otherwise you end up with a film of fat floating on top- ick! Can you use jarred sauce to start with? Absolutely, I have never been able to find a prepared sauce that I like, so I don't, but if you have a favorite, knock yourself out! Can you cook the pasta in the pot? Yes. You can. Hold your pasta back and add it dry and uncooked during the last hour on high. Now, to be honest, I have never done this. I like more control over the texture of my pasta than the crock pot will give me. Also, everyone in my house likes their food a different way...some prefer more sauce, some less. Once you dump that pasta in the pot, it's covered and that's that. Now a question for you...does anybody out there use the crock pot liners? I have been hesitant as I am not sure if they alter the taste of the food in any way...or if it's healthy to have your food cooking in something for so long when you're not supposed to leave your water bottle in your hot car! Any opinions would be greatly appreciated! Lastly, in the interest of full blogger disclosure, I would like to state that these photos were taken in a very, very messy kitchen. There were dishes in the sink, food prep happening on the countertop, homework on every table and kids were asking me to please stop taking pictures so they could just eat...exactly what you would expect the kitchen of a busy family to look like at dinnertime during the first week of school! Thank goodness for close ups! I hope you enjoy this easy meal! I like your keeping it real theme! And, those meatballs look delish! Thanks Roshni! Life is messy, especially with kids! I just want to make sure that people get it that even though the pics look perfect, my house is most certainly not! I love this - my kids don't like meatballs (ridiculous, right? ), but my husband and I do. Now I can make the meatballs in the crock pot and everyone can top their pasta the way they want. I never thought of cooking them this way - thanks Kim! Dana, both of my parents were first generation Americans. 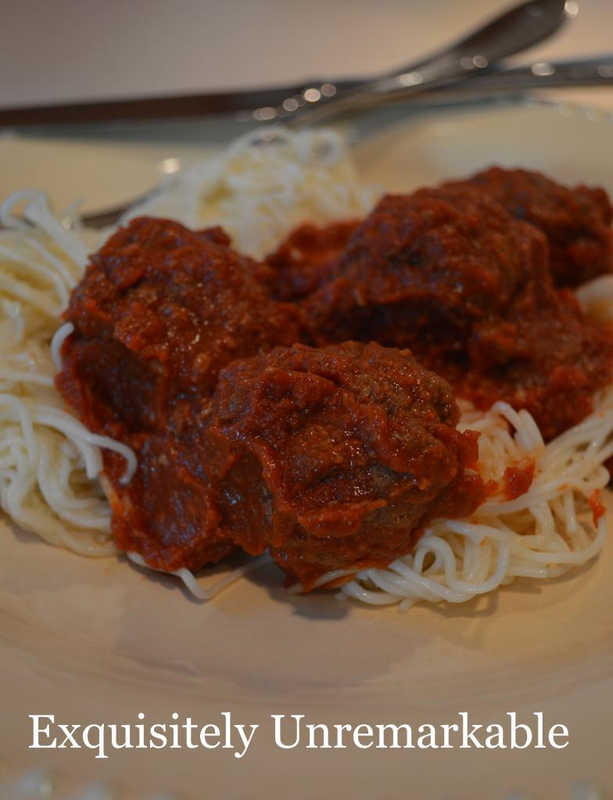 Growing up we ate a lot of very authentic food and, with a Sicilian dad, meatballs and sauce was a staple. It was cooked all day and made from tomatoes. It never dawned on me to use a slow cooker for this meal until last year. It's been a real lifesaver on many busy nights! Kathy, thanks so much for popping by to take a look! Thanks for the link up~ always happy to be a part of it! 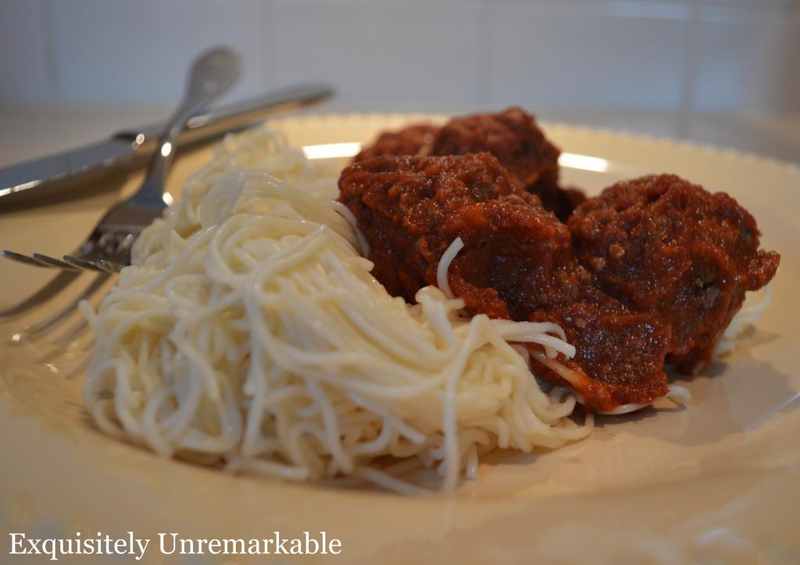 could you make the meatballs, put them in and cover them with spaghetti sauce from a jar? Or would you recommend just doing the meatballs there and the sauce separately? I am older than you and more harried, so I really need to cut down the work of cooking. Hi Jane, I am so sorry that it has taken me so long to respond. That is how I make it, I put the meatball in the crock pot and the sauce right on top of them. It's super simple that way and cuts down on a lot of the work. I hope that helps and again, I'm sorry your comment got lost in the shuffle!